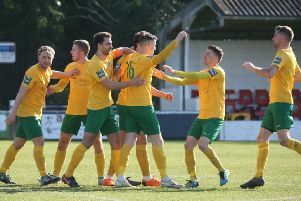 Rob O’Toole got the only goal of the game to fire Horsham back to winning ways in an ill-tempered affair which saw blood and broken bones against Ramsgate on Saturday. The striker netted a second-half winner to secure the Hornets a handy three points in the Bostik League South East Division play-off race at Culver Road. A tough-tackling visiting outfit did their best to upset their hosts in what was a disjointed afternoon where both sides had a player sent off and ended in what the Horsham camp described as a ‘mess of a game’. With Horsham having taken the lead shortly beforehand, the clash finally boiled over between both sets of players on the sidelines and Lewis Hyde was shown a red card in the closing stages. Seconds later, after Horsham gave away a foul, the players again piled in and referee Graham Ion showed Rob Saunders a second yellow. Considering the bruising nature of the encounter, Hornets boss Dominic Di Paola was delighted with the win that moved fourth-placed Horsham onto 41 points. The manager said: “It was a bit of a mad game, really. I just never felt from the first minute that the referee ever got control of the game. “It was a bit of a tricky one as we were constantly battling against provocation. I was pleased that we did not react in any way. “Rob O’Toole got a broken nose, Charlie Harris was on the end of a bad one and it looks like a tear or tweak to the MCL. Dean Lovegrove was elbowed in the face, so there was a bit of blood about. “We are not shrinking violets, we never have been and have players that can stand up for themselves, but I think a lot went over the top. “The biggest factor was the ref was unable to manage the game. It shows how he lost control in the last 15 minutes and ended up having to deal with a mess of a game. “The win was tricky, the rain was tricky. There were a lot of factors that made it a big battle, but it’s another great win. We have had some good ones and that was another. “It was a game of few chances where they parked the bus a bit. Pells (Josh Pelling) had one save to make, although it was a great save. The Hornets wasted three great chances in quick succession to take the lead midway through the first half. The best saw Lee Harding spurn a super opportunity when he fired straight at Luke Watkins from two yards out. Horsham also had a strong shout for a penalty turned down by Ions as Kieran Lavery appeared to be bundled by Saunders inside the box. At the start of the second half, Saunders was somewhat fortunate to only receive a yellow card for a poor challenge on Jack Brivio and the hosts were also forced into another change when Charlie Harris was injured in another hard tackle. Pelling made a good save to deny Aaron Millbank’s ferocious strike, but it was Horsham that continued to look the more likely to take the lead, although Ramsgate’s George Crimmen did see an effort cleared off the line. Substitute Chris Smith then created the opening goal as he raced away and latched onto a ball over the top to feed O’Toole to prod home from six yards. Horsham were denied another penalty when Smith was upended and despite the late ill-tempered clashes and red cards, the hosts held out. Horsham: Pelling, Metcalf, Shelley, Hyde, Sparks, Hayward, Harris (Lovegrove 56), Brivio, Harding (Richardson-Brown 78), Lavery (Smith 66), O’Toole. Unused: Merchant, Taylor.